Okay, okay… so admittedly, this post is a day early for Wednesday Appreciation, but bahumbuggery to that! When I was around six years old, I had a pet kangaroo named Raspberry. Well, to be fair, she was more of a best friend than a pet (although, if you look it up in The Concise Dictionary of Six-Year-Old English, it will tell you that ‘pet’, when used as a noun, is synonymous and effortlessly interchangeable with ‘friend’). More to the point, she was an animated best friend, which also explains why she could be purple and non-animated kangaroos are seldom found to be so. Finally – and as you may well have guessed by now – her Most Favourite Thing of all things was a juicy raspberry. So come her birthday, my pet expected what any animated, purple kangaroo named Raspberry might: namely, a raspberry cake… With purple-coloured cups of raspberry juice… and raspberry muffins with a healthy smearing of raspberry jam… and of course, raspberry tarts (of which I, at six, had only a very vague idea, having read about such sweet things called ‘jam tarts’ in my English stories of croquet and roasted chestnuts – for which I reserved similarly vague ideas as well as childish yearnings). So the story of a tiger who comes to tea would not be a totally unfamiliar one to my poor mother, who became very good at pretending to make delicious, raspberry-flavoured treats. Tigers having captured the imaginations of men, women and children the world over for time immemorial… Did that sound authoritative enough? Anyway, they do, and continue to do so… Blake found in them a “fearful symmetry” “burning bright”, and for Kipling the tiger was the indomitable primitive power at the heels of Mowgli in the terrifying Shere Kahn. But trust the child to take that which embodies the creature beyond taming, and invite it in for a cuppa tea. However, while some reviewers have read Kerr’s interpretation of the tiger as one that is harmless and lovable, to my mind, hers is more of an ink-blot test. And in this ink-blot, I see a pair of sly but smiling eyes. Arriving at the door and asking if it might join Sophie and her mother for tea on account of being “very hungry,” the tiger precedes to eat all the sandwiches on one plate (“Owp!”), then the buns, the biscuits, all the cake, all the milk in the jug, the tea in the teapot, to clean out the refrigerator and kitchen cupboards, finish “all Daddy’s beer,” and finally, to go so far as to drink all the water out of the tap. Make no mistake, this is hardly a tame tiger… a gluttonous tiger perhaps, an opportunistic tiger, certainly… But a tiger, nonetheless. Unpredictable, volatile, and not entirely unlike children themselves. And, as it just so happens, the tiger also ends up being a very good excuse as to why Sophie cannot take her bath later that evening (with no water left in the taps! ), and the reason the family has no choice but to go to the cafe down the road for a supper of “sausages and chips and ice cream.” Mum, Dad, and Sophie walking past a stripy, orange cat on their way out for dinner, Kerr gives her readers a final knowing wink. We’re told that the tiger never returned to Sophie’s house, leaving the large feline more than free to show up unexpectedly one day at anyone’s front door. Or so I’d imagine. Picking up a dinosaur book from one of the shelves, Dog begins to read, and so doing forgets about the outside world and his empty shop. Furthermore, he feels no longer alone, as the room has become crammed with dinosaurs (of which one has, in my opinion, over-eager eyes and rather fearsome teeth). Leading his dinosaurs like some Pied Piper, Dog goes traipsing through the store carrying the book that has now transformed his surroundings into a primordial, overgrown jungle. And thus it happens that when one adventure meets its ending, our dog has simply to pick another off his shelf, the next being a book entitled Marvellous Marsupials (which he hands down, from the stepladder, to a merry-looking kangaroo)… So a “new adventure” begins! A valuable lesson is thus learnt and no longer does our dog just loves books; “most of all… he loves to share them!” For an added delight, children (and grown-ups) can turn over the page to find the credits page embellished with a dinosaur reading a dinosaur book. And in a sense, this is the same reward readers have in reading a story about books, about a character who loves books. They get to read a little (or a lot) of themselves into that character, and perhaps even feel that they have a tangible role to play in the story itself. Perhaps, like Yates’ white, short-haired terrier, you too will want to blast your trumpet, shouting out, “I, SUE/PETER/LILLIPUT/GERALD/GERALDINE/RUDYARD/CHRISTOPHOLUS, LOVE BOOKS TOO!” for all the world and then some to hear! I adore Lauren Child’s work! Not only is her knowledge of children and their quirks quite beyond compare (see exhibit A: her Charlie and Lola series), but her illustrations perfectly convey the reckless abandonment of childhood creativity in their unapologetic imperfections. Far from scraps of paper neatly snipped and seamlessly pasted next to each other, or lines dictating where she may or may not colour, Child recreates her imaginative world in a way that can only be construed as one thing: PLAY! 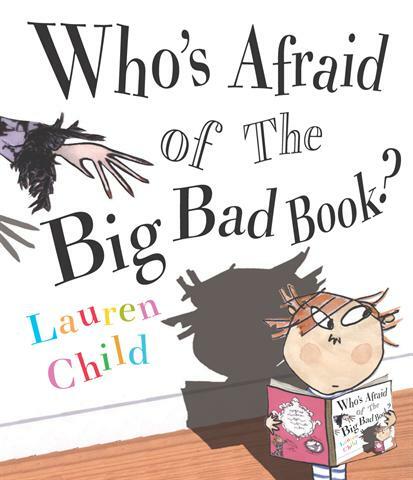 Who’s Afraid of the Big Bad Book? is the kind of book I’d give to someone if I wanted to convince them in the matter of the greatness of Lauren Child. Unique but unforgettable, entirely contemporary but still timeless, it is every bit a testiment to how wonderful a storyteller she is. And like all decent fairytales, this one is not without a moral that any book-lover will appreciate: treat your books with kindness and respect, lest you incur the wrath of their characters. And for one second, let’s pretend we weren’t kinda glad to see that greedy little pair of suspender-wearers almost end up in a witch’s oven. Serves them right for eating other people’s houses… Or was that ‘taking sweets from a stranger’? And pigs should know better than to build their houses out of wolf-friendly materials… It’s a good thing one of their brothers turned out to be the Bright One in the family. And Snow White eating apples, as if Eve didn’t learn that lesson for all of us (or at least those of us forced to attend Bible study where miserable, old biddies preached fire-and-brimstone). Point is, there is a certain sense of justice when characters are ‘rewarded’ for their tomfoolery, so to speak, and many a-time in real life when we wish a witch would just shove someone into her pre-heated oven for us. So while the lesson-learner of Child’s book isn’t quite visited by the ghosts of Past, Present and Future, he is visited by the disgruntled characters of his storybook when he falls into a collection of fairytales one night. Climbing through the hole in the page, Herb finds himself in a room where Cinderella’s ugly step-siblings and stepmother have been snipped and glued to the ceiling. (Here, readers will have to engage in the story’s topsy-turvy shenanigans by flipping the book upside down to read harsh words flung at the boy from above.) From one page to the next, Herb encounters these past sins of book defacement and, finally ‘waking up’ from his bizarre adventure, resolves to set it all right. Together with his friend, Ezzie, Herb spends “the rest of the night putting the storybook back to rights: rubbing out moustaches, cleaning out crumbs and blowing away dust,” rescuing a bewildered Prince Charming from his mother’s old birthday card and returning him to a thrilled Cinderella… And while he resists the temptation to leave the “wicked stepmother’s room upside down,” he does help the three bears by “drawing a padlock” on their front door. (Ezzie likewise can’t resist sticking a wig on Goldilocks; “Well, serves her right for being such a meany.”) So this story ends, with Herb having learnt a lesson that parents will happily thank Child for, and “a very cross little girl with mousey brown hair” trying to get in through a securely-padlocked door. The End. While ‘book books’ are grand in that they encourage the child’s active participation during story-time – encouraging, as they do, a love of books – picture books can also help in the development of a child’s confidence in reading too. Take Katie Cleminson’s Wake Up! (It’s going to be a busy day…) as a case-in-point. “Wake up…” whispers the elephant’s trunk on the opening page, a little boy soundly asleep with his toy rabbit next to him… “and up,” as the elephant trunk picks him up, eyes still closed, by the back of his pyjama top… “and up!” as it deposits him safely on the elephant’s head, our boy now smiling and gladly awake. “And stretch and scratch, and scrub and wash, comb your hair, give teeth a brush. It’s time to dress. Dress up… and up, and up!” The little boy leads the procession, still in pyjamas but with the additions of a hat and toy sword, not to mention a cat in a red tasseled fez, and Lemur in king’s robe and crown. Finally, the child is dressed and ready for school, where they will “Listen up… and up, and up!” Here, the scene is truly a sight to behold as a big bear in a red cardigan addresses a classroom full of children, each one accompanied by an animal. One bespectacled young man stands proudly, but attentively, next to a raccoon, while a little brunette gazes dreamily ahead with an equally dreamy-looking penguin, and another girl dearly looks down at her pet hamster. And so it is time to “read and draw, and count and spell, and ask and answer, show and tell.” And soon after this, it is “time to play,” so “swing up… and up, and up!” You get the gist. All along, however, children are not only rewarded by the repetition that begs for their participation, but also by the illustrations with their old-world innocence to them. Their creator, Cleminson herself, admits to being drawn to things of the past, from gramophone players and bowler hats, to the pipette with which she manages to draw from the happily more organic and impulsive heart. And I am all the more grateful to her for these lovingly rendered characters in predominantly primary-coloured palette, given life and shape and detail by their fluid ink outlines. Most will already be more than familiar with the signature, so to speak, of Lynley Dodd in the character of Hairy Maclary, a staple in any littlie’s library. However, whether fan or newcomer, few could be disappointed with My Cat Likes to Hide in Boxes. 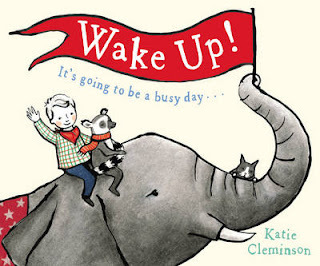 This next picture book follows a similar path of rhyme and reason as the ‘up and up and up!’ progression of Cleminson’s Wake Up! 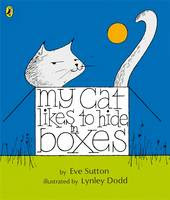 “BUT MY CAT LIKES TO HIDE IN BOXES” comes the final sentiment, as the bear in the toy trunk has been wedged into a corner by the narrator’s box-crazed pet. So not only does the book speak in a language children can understand, the language of the beloved pet, totally unlike anyone else’s… But the cherry-on-top is the humourous use of rhyming and repetition that will have kids telling the story out loud before they’re even able to read, undoubtedly impressing their glowing grandparents (who you know will return to your home-town with tales of Incredible Timothy Tomkinson, the child prodigy who read My Cat Likes to Hide in Boxes at the tender age of 2). Kidding aside, children will love knowing what comes next, and begin to feel more than capable of story-time role swap, reading to parents instead. And ultimately, a confidently faking ‘reader’ will make for a child who finds books inviting instead of intimitating. Frankly, a parent couldn’t ask more out of a picture book. Finally, my latest prized picture book is the “magical alphabet” that is Lucy Goes to Market. Caught in the act of a giggle at Who’s Afraid of the Big Bad Book?, my grandfather asked after what it was I found so funny. Predominantly a numbers man (aside from an appreciation of Roald Dahl that is limitless), these kinds of situations involve a slower, more logical and in-depth rationale. So I explained that it was all the little priceless moments hidden throughout that really made the book… As when Herb’s books occasionally have “the odd pea squashed between the pages” on account of Herb’s habit of “read[ing] his books everywhere,” I showed my grandfather the squashed pea Child had cheekily placed at the bottom corner of the same page. “Do you think children really spot these tiny details?” he asked. “Well, if they practice often enough at Where’s Wally? they do,I answered confidently. No, this is not entirely true. I thought this last bit to myself, yes. But what I answered was a bit more grown-up. What I actually said was that this was where I felt parents had an important role to play. Parents can complain as much as they like about a teenager’s inability to spell or do well in a comprehension test, or a child’s lack of enthusiasm when it comes to reading, but often this could be afforded a little more reflection. There is a special kind of joy in parent and child perusing picture books together from an early age onwards, in pointing out squashed peas, and cats hiding in boxes, and greedy-guts tigers to each other. Herein, the act of reading is introduced not as a task, but as a fun activity to be shared, as an imaginative escape before bedtime, as an open space where nothing is off-limits (not even a cat from Spain flying an aeroplane), and where emotions and experiences are brought to the fore within the comfort of the child’s own home (as in, say, Jeffers’ The Heart and the Bottle). 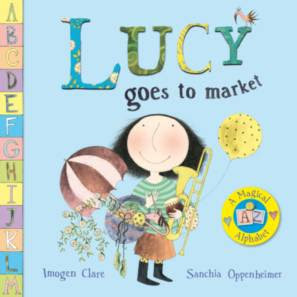 In this – that feeling of togetherness that comes with story-time – Lucy Goes to the Marketmakes for an ideal start. Firstly, the words chosen by Oppenheimer are wasted if not read aloud. (Try saying “a unicorn umbrella and a vulture with vertigo” quietly in your head… It’s not anywhere near as satisfying!) Meanwhile Clare’s dream-like and sweetly detailed illustrations are entirely suitable for hours of browsing and reading pleasure. (Here, too, at the book’s beginning, there is the added incentive as Lucy’s snail asks of readers, “Look for me on every page.”) Also, parents may be pleasantly surprised that, with their child/ren, a new language is steadily being learnt, one that involves “endless eccentric eggs,” and where citrus slices are in fact better known as “marmalade moons.” Put this way, if Lucy Goes to the Market were a dollhouse, it would be a site of endlessly eccentric and wonderful moments of play for you and your child/ren, and should equally manage to do so as a picture book.